The instability and uncertainty of Buenos Aires and its port dwellers, Los Porteños, is legendary but the Argentine Tango is steadfast. Appearing in the Rio De La Plata region sometime in the late 1800s, the tango follows the history of the Porteño, an immigrant whose fortunes rose and fell in a dramatic saga. The Tango, the music and the dance, absorbed it all. The Tango has always been a refuge for the Porteño, it is where he put his heart and soul, and this artwork, Siempre Tango, evolves from there. 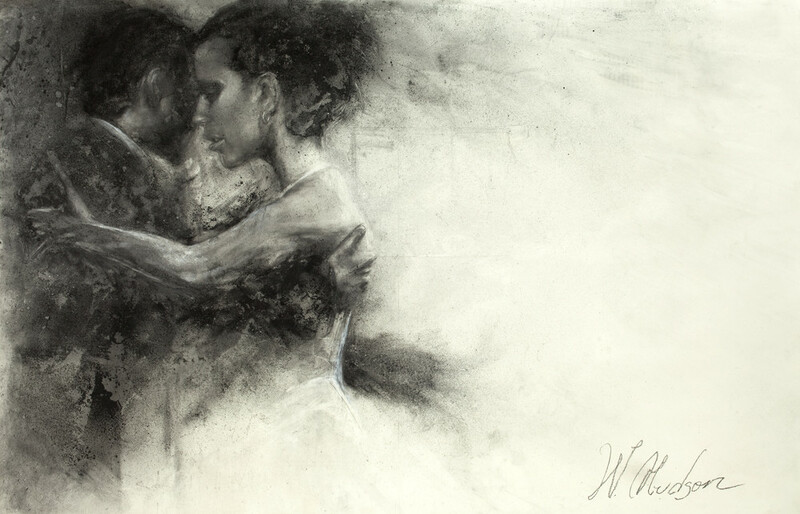 Rich layers of charcoal convey the moody nature of the dance, and the medium suggest the smoky, ephemeral character of the milonga. Indeed, the blotchy Rorschach character of the piece reaches into the Porteño psyche where dark notes form a strange beauty. Yes, extremes of triumph and tragedy form the Porteño narrative but there’s always the tango.